1. Juice Beauty Green Apple Age Defy Moisturizer. I love a good moisturizer, especially one that has anti-aging benefits. I have been trying out a lot of anti-aging samples lately, so I am anxious to try this one, as well. Anything that can keep my skin looking fresh and healthy is a winner in my book. 2. 12 Benefits Instant Healthy Hair Treatment. Another good one. This is a leave-in conditioning spray that claims to correct damage from pollution, heat styling, and other things that can damage your hair. I actually use a leave-in product each time I wash my hair. Trying to find the perfect conditioning spray is almost like the quest for the perfect eyeliner! Plus, it comes in a fun hot-pink bottle, which actually makes me like it even more. Can’t wait to try it out. 3. OPI Nail Lacquer in Pink Outside The Glossybox. This OPI color was made for Glossybox. It is a pretty pale pink, which is a staple in my nail wardrobe. I can already tell that this will get a lot of use. OPI polishes are fantastic, so this was a big score. 4. 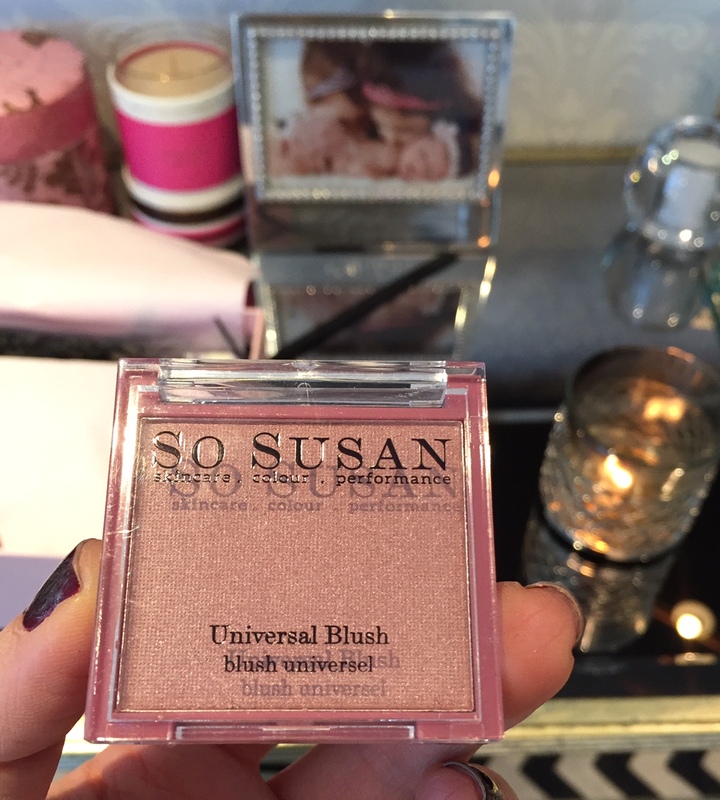 So Susan Cosmetics Universal Blush. This rose-colored blush has a subtle hint of shimmer. It really is quite pretty. Supposedly, this blush adapts to each wearer’s skin tone for a unique flush. Sounds interesting, and from just looking at the color sitting in the palette, it looks promising. The color is much prettier in person – It photographed a little weird in the picture above. 5. Knepp Herbal Bath: Balancing In Lavender. This is a concentrated bath treatment with essential oils. It claims to fight mental fatigue and to bring about a feeling of ease. The scent of lavender is actually immediately calming. If this busy mommy ever has time to take a bath, I would love to try it out. As for now, a bath will have to wait… Sigh. Overall, this month’s Glossybox was filled with fantastic beauty goodies. I am very excited to try these new products. I’ve never heard of Glossy Box before, definitely going to check it out!